These Pearl Half Sunflower Bali Earrings are hand made in Indonesia. 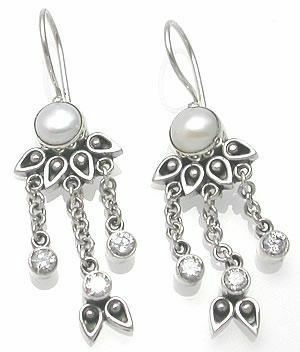 These unique earrings have a synthetic pearl at the top with half a sunflower and three dangly sterling silver chains with crystal jewels connected below. Add pizzazz to your outfit by adding these matching Flower Belly Button Ring to your ensemble.